Nickie, Nickita & Nickole are three zippin' sisters. Purse-Nickities are wonderful! 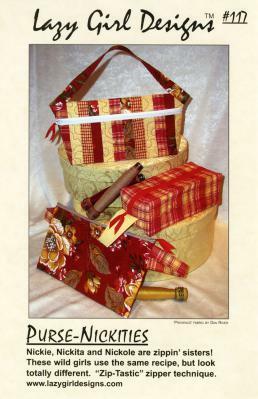 They may be made from fat quarters, pre-quilted fabrics or a bunch of scraps. Nickie measures 6" x 12"
Nickita is 3" x 4" x 9"
Nickole measures 7" x 12"
These fun bags are all made from the same set of ingredients with an all-purpose zipper that is easy to install.